Meg cleaned out her closet on Saturday. Guess where she put all the stuff she is no longer wearing? Right in the foyer for everyone to see. I'm so glad we haven't had a lot of company lately. 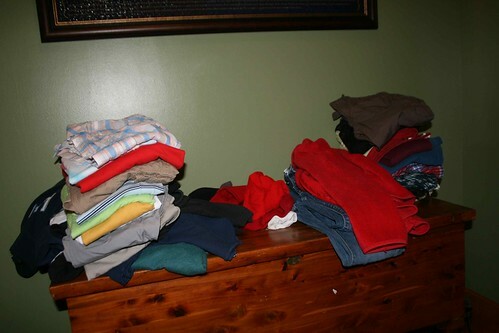 (I folded the clothes because she left them in a big ugly pile.) Mattey went through the clothes to see if there was anything she wanted. I think she walked away with one or two things. I think I need to find a girl smaller than Meg and with her tom boy style to give the clothes to. Anyone have a girl that fits that description?